The bingo and gaming group Gala has been bought by the private equity firms Candover and Cinven in a deal worth £1.25bn ($2bn). 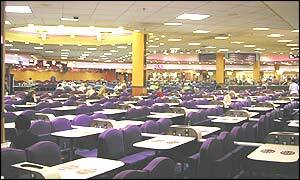 Gala is the biggest bingo operator in the UK with a 40% share, 166 clubs and six million members. It also has 28 casinos with 1.2 million members, and operates an internet gaming business. "This deal represents a fabulous opportunity for Gala to grow in the proposed modernised gaming environment," said Gala chief executive John Kelly, who will remain in place following the deal. "I believe there will be strong potential for both organic growth and expansion by acquisition in the coming years." The deal is the third management buyout since it was bought from Six Continents, then known as Bass, by PPMV and Royal Bank Development Capital in 1997. In March 2000, it was sold on to CSFB Private Equity for £400m. Reports have suggested that it was originally planned to float Gala on the stock market, but these plans were abandoned given the current depressed market conditions. Bingo's popularity peaked in the mid-1970s when there were almost 2,000 clubs in the UK. Over the next couple of decades attendances plummeted and hundreds of clubs closed. But attendance figures held broadly steady during the last 1990s and revenues and profits have staged a comeback. Since being sold by Bass, Gala's earnings have risen from £36m to a predicted £133m for this year. There is also the possibility of further growth if the UK gaming industry is deregulated further. The Budd report into gambling proposed eliminating restrictions currently in place on 'softer' forms of gambling such as bingo.